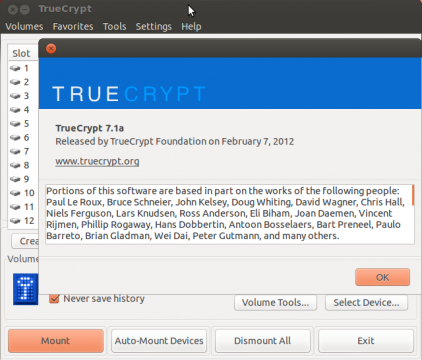 This simple tutorial is going to show you how to install TrueCrypt in Ubuntu. TrueCrypt is a program used to create encrypted partitions or virtual encrypted disks. It is recommended for advanced users only. You can check 32-bit or 64-bit using System Monitor, it can be launched from the dash. Just click Install on pop-up wizard. 4 users responded in " Install TrueCrypt in Ubuntu 12.10 & 12.04 "
How do I use it now? I have a truecrypt archive to open. There is a screenshot of the truecrypt app above, would be really helpful if the article covered how to get to that. Thanks, it has been very helpful for an ubuntu new arrival.